Ra’Shawn Jones ’20 gets down in the blocks. He stares down at the track. As he lifts his gaze, the look in his eyes can be intimidating from a distance. It’s not just intensity. It’s fire. Maybe even a little bit of rage. 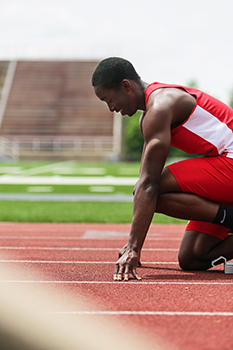 It wasn’t that long ago that clearing a hurdle was practically impossible for him. His hips were almost a foot lower than the hurdles. But he kept growing. So he kept trying. 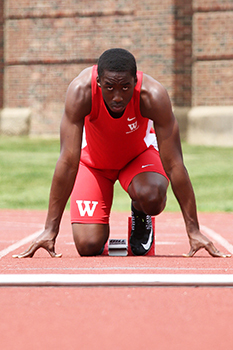 On Friday Jones, now at 6’4”, will be running the 110-meter hurdles at the 2018 NCAA Division III Outdoor Track and Field Championships. “I think he can be an All-American if he keeps the chip on his shoulder all the way through,” Head Track and Field Coach Clyde Morgan said. Jones doesn’t give up when it gets hard. He never has. Not when he grew up rarely seeing his father. Not when his family didn’t know where their next meal was going to come from. Not when his family didn’t know where they were going to live. 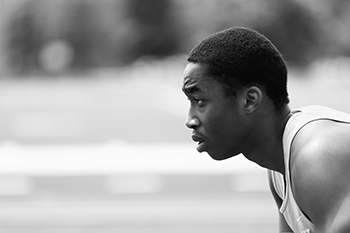 And no matter how fast this runner gets, he will never leave the people he loves behind. It was his sophomore year of high school. His family had just been evicted from their apartment, leaving his mother, older sister, and him with no place to go. There were nights spent in a motel room. There were nights spent in their car. Only those closest to Jones knew about his family’s situation, but they were few and far between. At school, Jones quickly ducked out of conversations that included the question, ‘Do you want to come over to my house?’ He was afraid of where that would lead. The day he turned 16, he got a job at Waffle House. And through it all, Jones was still mad if he brought home a C.
He received offers from Division I schools. None of them were full-rides, though, so none of them were offers he could accept. That’s when Clyde Morgan called. But the more Morgan found out about Jones, the more he liked him. “Some people run away from kids like Ra’Shawn. I run toward them,” Morgan said. 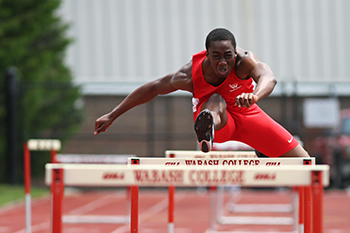 “I just thought he needed me, and he needed Wabash. So I rolled the dice. All Morgan asked Jones for was one visit. That was it. His first year came with a lot of ups and downs. It came with a few tears. But Morgan was there every time. “He’s probably the only person I could look up to like a father,” Jones said. “It would be nice to come close to being someone like him. Jones’ Twitter handle is @silent_goof. He said he changed it one time, but those two words describe him perfectly. In class, the religion major thinks a lot, but he doesn’t say much. “He’s soft-spoken at first but then gregarious once you get to know him a little bit,” Professor of Religion Derek Nelson said. “He’s driven and he’s grown a lot in two years – perhaps more than any other student I can think of. Then there’s the side of Jones that lets loose at practice. Morgan runs a tight ship, so there’s no time for a runner not to be on top of his game. But Jones has made him take a step back. “I’ve had to stop myself and go, ‘That’s OK,’” Morgan said. “He’s had to grow up a lot quicker than a lot of our other guys. He’s allowed to be a little goofy right now. One of those times came the night of the track and field awards banquet. Jones received the titles of Most Improved Player as well as Most Valuable Player, but he wasn’t there to accept them. His niece, La’Riyah, is almost 18 months old. Her birthday is December 25. He doesn’t get to go home very often, but when he does, his niece is one of the first people he wants to see. He says he doesn’t want to spoil her, but the dozens upon dozens of pictures on his phone say otherwise. Jones’ mom used to tell him to treat life like a race. “Just get over the hurdles and you’ll be fine,” she’d say. He’s done it well so far, but the rising junior isn’t stopping any time soon. But Jones also slows down when he needs to. He’s making sure he enjoys every moment here because it’s the most stability he’s had in a long time.